The Mascoutah Color Run will begin at 8:00am on Saturday, March 30th. 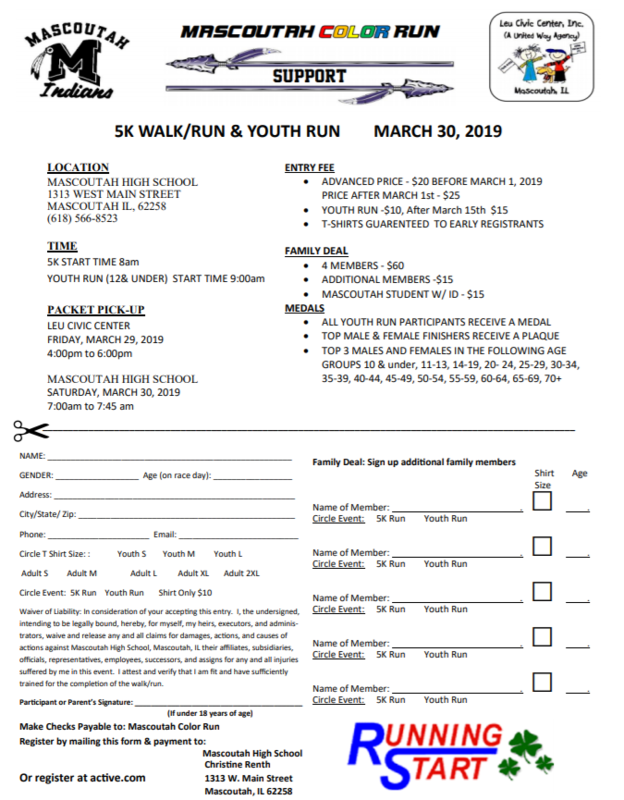 The 5K will start at Mascoutah High School, travel to Mascoutah Elementary School, and then back to Mascoutah High School. There will be approximately 5 color stations where runners/walkers will be covered in colored power. This is a great way to have fun with family and friends, get great exercise, and support both the MES and MHS PBIS programs. These programs pay for all the rewards for students including end of the month rewards and our wampan store. Walkers or runners are welcomed! There is also a "Kids Run" that begins at 9:00am. This run is only 1 mile and will have color stations along the way. To register for the Mascoutah Color Run, either return the form below or visit Active.com to register online. Thanks for supporting our PBIS programs!